Born in Belfast in 1955. His mainly landscape inspired works, are extracted from his journeys across Ireland. The viewer is offered an essence of these places and periods- fleeting insights into May’s visions and memories. This self-taught artist has painted all of his life; the catalyst being the gift of a watercolour set by his mother. 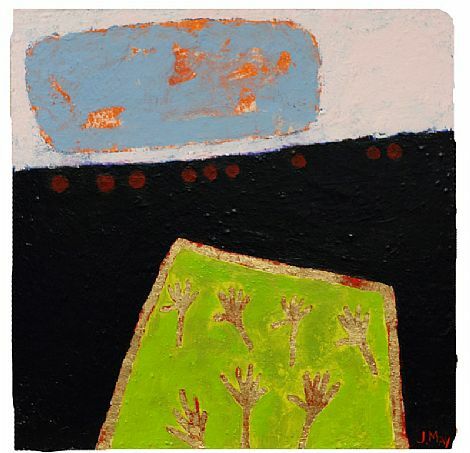 His work still retains a candid quality, which is demonstrated by his fascination with colour, mark making and texture. May is continually inspired by the shapes and colours, which envelop him. The artist contemplates and considers these surroundings and successfully draws the viewers’ attention to the unnoticed, or even taken for granted scenery. May’s unique method of palimpsesting layers is central to his work. This complex process is one of discovery for both the artist and the viewer. At his studio in his home of Lisburn, James is a multi-tasking artist joyfully manoeuvring from one composition to another, until he is fully satisfied with the outcome. Elizabeth Baird of the Belfast Telegraph has described May’s work as “having it all- colour, humour, pattern, design, balance”, and of being “an absolute pleasure to look at”. James May has exhibited widely throughout Ireland. His work is found in both private and public collections, such as the Dept of the Environment, the Arts Council and the BBC London. In 1991 May was awarded the prestigious Silver medal, at the RUA, chosen by the late Tom Carr.